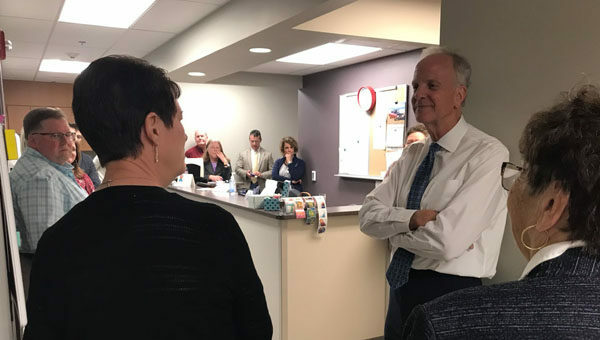 United States Senator Jerry Moran offered his help when he stopped in for a visit on Friday at the Hillsboro Community Hospital. “The offer stands for our help however we can do that,” said Moran. In addition to taking a tour of the facility, Moran visited with various staff members as well as city officials including city administrator Larry Paine and Mayor Lou Thurston. Paine asked Dean Hein to share with Senator Moran how important the hospital has been to him. “I had a heart attack a few weeks ago. I drove myself here and Dr. Erb was here. Within five minutes, I coded, and he brought me back to life. If this hospital wasn’t here, I never would have made it,” said Hein. “There is an attitude in Washington D.C. that the agency that really runs our hospitals is Center for Medicaid and Medicare Services (CMS). It is often evident that there is a belief within the CMS and the Department for Health and Human Services of ‘why do they need all these hospitals out there?’ ‘Why can’t they be further apart?’ Part of the answer is your story. In the absence of access to care, people don’t live,” said Moran. Hein’s wife, Beth, added that the hospital not only saved her husband’s life, but they added to the quality of his life. Moran shared that he has visited all of the hospitals in Kansas and some several times. Friday’s visit was his second visit to HCH. “I think the most important thing is to get information out. 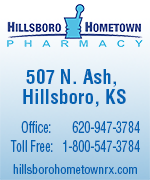 Awareness is pretty critical,” said Thurston regarding the issues of the hospital. “I will never give up on a community unless they give up on themselves. As long as they are still willing to fight for what they want then I want to be their ally. 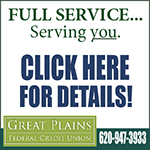 We’re there as long as you’re there to see if we can’t open a door or find a grant or whatever we can do,” said Moran.